The Crime Prevention Unit works to educate the public on matters of Crime Prevention and Safety through the media, public speaking engagements, web-site, and direct communications with more than a hundred-and-fifty neighborhood associations and apartment communities. To receive periodic Crime Prevention messages go to NOTIFY ME and register to receive BOTH "Team Area" and "General" messages. See the list of documents on this webpage for helpful tips and advice on many aspects of Crime Prevention and Safety. The Crime Prevention Unit of the Community Outreach Office is staffed by Senior Police Officer Sosa, a Crime Prevention Specialist certified through the International Society of Crime Prevention Practitioners (ISCPP) in both general crime prevention and CPTED (Crime Prevention Through Environmental Design), as well as Officer N. Brown. The Crime Prevention Unit is tasked with educating the public to recognize their risk of crime, advising them what measures can be taken to reduce their risks, and motivating citizens to enact those measures. Crime Prevention Officers encourage “Hardening-the-Target,” which means to enact measures to make it difficult for a criminal to commit his planned crime. Target Hardening is meant to discourage or deter a would-be robber, burglar, or thief by increasing his risk of being seen, heard, or caught during or after the crime. This can be done by individual citizens, as a group of neighbors, as a business, or as a whole community. The Crime Prevention Unit approaches these tasks by offering free information and services. These include residential and business security surveys, attendance to public events, and public speaking engagements for youth, adults, neighborhoods, and businesses. The Law Enforcement Explorer Post also assists in these endeavors. Services of the Crime Prevention office are free of charge, but are subject to availability. Two- to three-weeks notice is requested for public events, neighborhood meetings, and other "after-hours" functions. Security Surveys are arranged as needed. 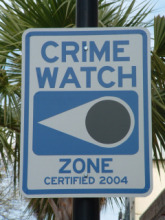 The Crime Prevention office assists neighborhoods in starting and maintaining their Crime Watch programs. See that section of the web-site for more information. This comprehensive risk assessment is offered to both individual residents and business owners / managers. Done by appointment, the CPS will meet with the property owner and point out risk factors - ranging from money handling procedures and personnel issues to physical security weaknesses - and will make written recommendations to reduce those risks . Primarily offered to citizens’ groups, Scout programs, and small school groups, subject to availability. Daytime or evening presentations can be arranged by calling 769-7407, 3-4 weeks ahead of your meeting date . The presentations listed here are given in person by the Crime Prevention Specialist or a designee, subject to availability. This list reflects presentations already researched and developed. They may be modified to suit your group’s concerns or for time. If you have an idea or request for a topic not listed, call or e-mail this office. The Charleston Police Department invites citizens who had contact with a Charleston Police Department employee within the past year to participate in this survey. The survey asks about your views and experiences with the police. The purpose of this survey is to assist us in our efforts to continually improve our services to the community. All responses are confidential and no responses will be individually identified. Your responses will be confidential and used only for research purposes. Select answers based upon your own experiences and perceptions. Please also respond to the open-ended question.